It used to be that your halftime entertainment choices on the biggest day in Football were numerous, but this year it is down to two. There is Beyoncé and for those of you that can break out of your food comma to grab the remote, there is the long running, ever popular and absolutely adorable Puppy Bowl. But what if you are a card collector looking for something more tailored to your interests? We are happy to announce we've got you covered. There is now a third choice. 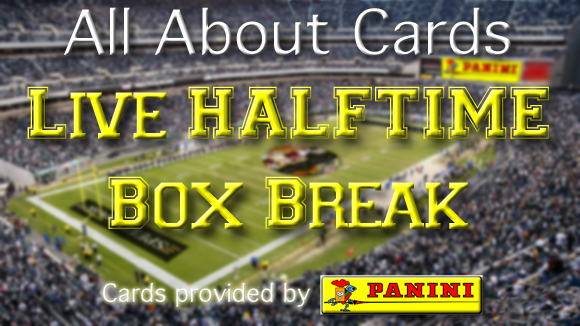 All About Cards will be doing a LIVE Halftime Box Break of some great cards that Panini America will be supplying and the best part is we will be giving those cards away to some of you who tune in. In addition to the Halftime Break, we will be giving away some other cool prizes, thanks to Panini, at the end of each quarter of the game. We will also giveaway something to the person that comes closest to guessing the final score of the game. 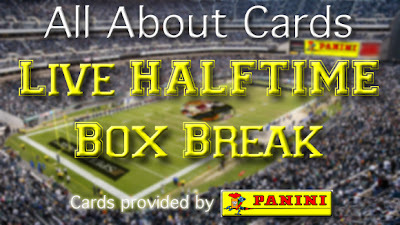 We will share more details about the boxes we will be breaking, how to watch our live break and more as we get closer to the game. For now, if you want a shot at some of the prizes, here is all you have to do.